Percy was born in Longton. He received a boarding school education and he then went on to attend Owen's College, Manchester and then onto London University, where he gained a B.A. degree. In 1881 Percy joined his father, Joseph, at Wileman & Co. Percy had not received any formal training in pottery, but became known first and foremost as a potter and went on to develop the lasting reputation of Shelley China. Wanting to improve the ware that the company were producing and get a better understanding of the export market especially America, Percy went to the U.S.A. and visited the 1893 Chicago Exhibition. 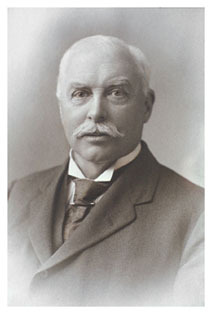 In June 1896, Percy's father, Joseph, died and at the age of thirty six Percy took over control of the business. To improve the ware he brought in artists and designers who he felt could (and did) change the company. The two best known were Rowland Morris and Frederick Rhead (see section on Designers, Modellers and Artists). Percy married in 1890 and his son Percy Norman was born in 1893 and a year later twin boys, Vincent Bob and Kenneth Jack were born.